Welcome to the Montgomery College catalog! Whether you are interested in attending Montgomery College, or are already enrolled, you can easily see the wide array of academic options that Montgomery College has to offer. Our online catalog can help you quickly locate and save details about our undergraduate courses and programs. Looking for a previous catalog? Select from the most recent catalogs below or click here to view all archived MC Catalogs. 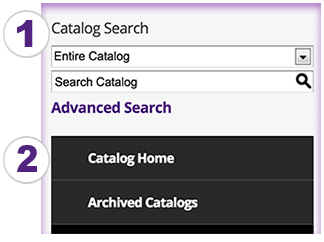 Catalog Search - In the dropdown in the upper right, select the type of information you are looking for. Or browse contents - Click on a link in the right navigation menu. Click this star icon in the top of any section you want to save to your favorites. The next time you go to My Favorites, your material will be there. Whether you are faculty member or a student, you can share Catalog information on Facebook or Twitter. Just click the icon and spread the word! Need a hard-copy? Click the print icon at the top of any page within the Catalog and generate a pop-up page formatted to print neatly. For general assistance and College information please contact the Montgomery College Response Center: response@montgomerycollege.edu or by phone at 240-567-5000. 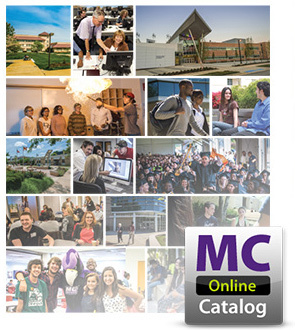 If you have any technical questions regarding the catalog please e-mail us at catalog@montgomerycollege.edu. If you are having difficulty accessing this site, please contact dss@montgomerycollege.edu. A mobile version of our catalog (m.catalog.montgomerycollege.edu) can be viewed on your Android or Apple device. The Catalog is also available on MC’s new mobile app. The College community can go to the Apple iOS App Store or the Android Play Store, type in, ‘Montgomery College’, and download the MC app for free.